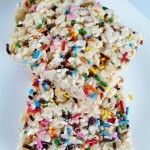 I love rice krispy treats. Rice krispies, marshmallows, and butter–so simple but so good. 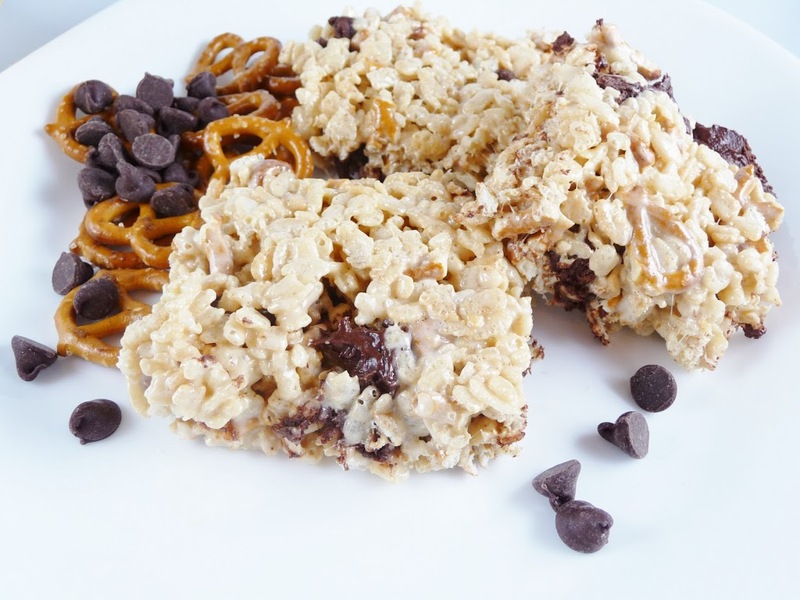 This is probably no surprise to any of you since I’ve blogged several different versions of rice krispy treats already…remember these with nutella or the cake batter ones? My original plan was to make a chubby hubby rice krispy treat. Chubby hubby ice cream has chocolate covered peanut butter filled pretzels with fudge and peanut butter swirls in vanilla malt ice cream. I’ve never actually had chubby hubby ice cream, but Jordan tells me it’s good—and I trust him ;). When I started though, I decided I wanted to add caramel and didn’t really want to use peanut butter so they weren’t exactly chubby hubby anymore. But they do have pretzels, vanilla, chocolate and malted milk powder. 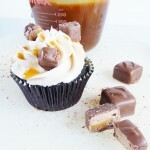 I used caramel extract but if you can’t find caramel extract you could just add a couple tablespoons of caramel sauce. I also used semi-sweet chocolate chips but I think they would be even better with a mix of butterscotch chips and chocolate chips. Don’t let the malted milk powder scare you off. You don’t really taste it–it just adds another layer of flavor, and the pretzels add a nice salty crunch. 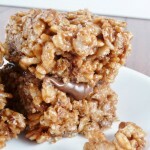 A nice twist on traditional rice krispy treats. Enjoy! 1. Butter 9×13 dish or spray with nonstick spray. 2. Combine butter and marshmallows in large microwave safe bowl. Microwave in 30 second intervals until the marshmallows and butter and fully melted. 3. Add malted milk powder and caramel extract to marshmallow mixture. Stir to combine. 4. Gently stir in cereal and pretzel pieces until evenly coated. 5. Combine chips, oil, and vanilla in bowl and microwave in 30 second intervals until fully melted. 6. Pour half the cereal mixture into greased pan. Spoon melted chip mixture over cereal (I just kind of dolloped mine over the cereal, you don’t have to spread it evenly). Top with remaining cereal and press down lightly with your hands or a greased spatula.